The McMurdo Dry Valleys, located in the Antarctic Victoria Land, are considered to be the closest of any terrestrial environment to Mars. Because of the similarities, the dry, hostile environment, where strong winds leave only loose gravel, could give important insights into how extraterrestrial plant life could survive. Cryptoendolithic microorganisms and certain lichens are the area’s only inhabitants. They find their way into the cracks in rocks to survive the climate. In hopes of learning more about the survival of the organisms in space, a team of European researchers collected two species of cryptoendolithic fungi: Cryomyces antarcticus and Cryomyces minteri. These were sent to the International Space Station (ISS) where their reactions to Martian conditions would be studied. Section of rock colonised by cryptoendolithic microorganisms and the Cryomyces fungi in quartz crystals under an electron microscope. / S. Onofri et al. 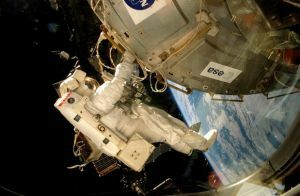 The fungi were placed in cells on a platform for experiments known as EXPOSE-E, a paltform developed by the European Space Agency to withstand extreme environments. The platform was sent to ISS via the Space Shuttle Atlantis and placed outside the Columbus module. For 18 months, half of the fungi were exposed to an atmosphere comparable to that of Mars. Among other conditions, they were subjected to high levels of carbon dioxide and ultra-violet radiation. Researchers also studied two species of lichens (Rhizocarpon geographicum and Xanthoria elegans) from the Sierra de Gredos in Spain and the Austrian Alps. Because the species are able to survive in extreme high-mountain environments on Earth, scientists were interested in how they would survive comparable Martian conditions. Some of the lichens exposed to the Mars-like conditions showed double the metabolic activity of those that had been subjected to just space conditions alone. In fact, the species Xanthoria elegans showed 80% more activity. The Antactic fungi was also resistant to the harsh conditions. 35% of the cells kept their membrane intact. “The most relevant outcome was that more than 60% of the cells of the endolithic communities studied remained intact after ‘exposure to Mars’, or rather, the stability of their cellular DNA was still high,” highlights Rosa de la Torre Noetzel from Spain’s National Institute of Aerospace Technology (INTA), co-researcher on the project. This is just the beginning of what is being called The Lichens and Fungi Experiment (LIFE), “with which we have studied the fate or destiny of various communities of lithic organisms during a long-term voyage into space on the EXPOSE-E platform,” explains De la Torre. “The results help to assess the survival ability and long-term stability of microorganisms and bioindicators on the surface of Mars, information which becomes fundamental and relevant for future experiments centered around the search for life on the Red Planet,” states De la Torre.